Directions (1 – 5): Study the following table carefully to answer the questions that follow. 1. What is the approximate percentage of booked flights by Airline’s C and D in 2015 compared to booked flights by Airline B in 2013? 2. In 2016, 35% flights are cancelled by Airline C due to bad weather and technical fault. How many flights are booked by Airline C due to Technical fault? 3. What was the average number of flights booked by the Airlines A, B, D and E in the year 2014? 4. What was the approximate percentage increase in number of flights booked by Airline D in the year 2012 as compared to previous year? 5. What was the difference between the highest number of flights booked by Airline E and the lowest number of flights booked by Airline B out of all the six years? Directions (6 – 10): Study the following table carefully to answer the following questions. The percentage profit is given on the total cost price. 6. What is the difference between the selling price of Sugar and that of Rice, if the cost of transportation is zero for both? 8. What is the percentage profit of Milk if its selling price is 80% of the cost price of Rice? 9. 4 kg Ghee, 3 kg Rice and 5 kg Milk are sold. What is profit or loss percentage? (The packing cost is zero for all goods) and selling price of Milk is 32 per kg? 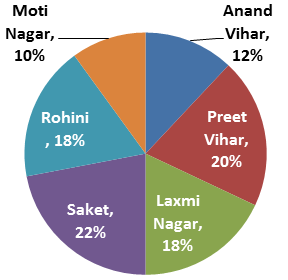 The pie chart shows percentage of people who travel on different routes of DTC buses in Delhi. 10. If 40% of the male travelers who travel on Preet Vihar and Laxmi Nagar DTC bus route are unemployed and 70% of the male travelers who travel on Rohini and Moti Nagar DTC bus route are employed, then find the ratio of the male travelers who are unemployed on Preet Vihar and Laxmi Nagar route to male travelers who are unemployed on Rohini and Moti Nagar route? 11. If 20% of the male travelers who travel on Saket and Laxmi Nagar DTC bus route are more than 40 years of age and 40% of the female travelers who travel on Rohini and Anand Vihar DTC bus route are more than 40 years of age, then find the total number of travelers mentioned on above routes who are less than 40 years of age? 12. The number of female travelers who travel on Anand Vihar, Preet Vihar and Rohini DTC bus route together is what percent more or less than the number of male travelers who travel on Moti Nagar, Saket and Laxmi Nagar DTC bus routes together? 13. The number of female travelers who travel on Saket and Laxmi Nagar DTC bus routes together is what percent of the total travelers on these DTC bus routes in Delhi? 14. Find the difference between number of male travelers who travel on Anand Vihar and Preet Vihar DTC bus route together to number of female travelers who travel on Moti Nagar and Rohini DTC bus route together? 7. E) ⇒ Selling price of pulse = 90 Rs.